For the 1990 edition, see Balance of Power: The 1990 Edition. 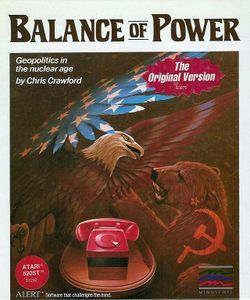 Balance of Power is a computer strategy game of geopolitics during the Cold War, written by Chris Crawford and published in 1985. The game is notable for engaging the player in nail-biting brinkmanship without using any graphics more complicated than an outline map of the world. Balance of Power was originally released by Mindscape for the Apple Macintosh and Apple II, then ported to Windows (1986), Atari ST (1987) and Amiga. It was a sensation when it came out, but as a brutally realistic (some would say cynical) depiction of superpower maneuvering. In 1986, Crawford published a book also called Balance of Power, which goes into great depth on the game, including the background of the politics, the formulas used to calculate prestige and related parameters, and an account of its (lengthy) gestation. This page was last edited on 29 May 2009, at 19:29.